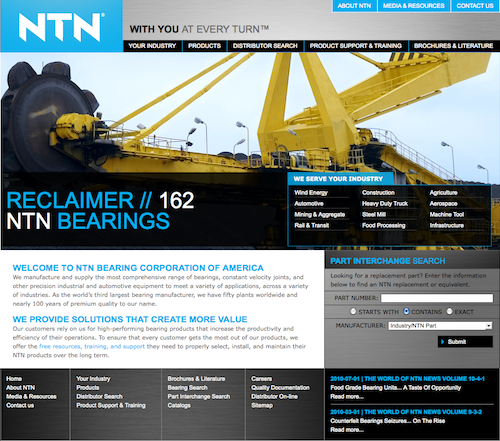 MOUNT PROSPECT, Illinois (January 17, 2013) – NTN Bearing Corporation has launched a new website to serve its North and South American customers. Combining its business territories in Canada, the United States, Mexico, and Central and South Americas, www.NTNAmericas.com allows visitors from all regions access to product information, distributor searches and training programs. “The new website embodies our efforts to offer the best services of each of our Americas regions to our customers. It’s an important component of One NTN, our internal campaign to provide a unified approach to serving our customers in the Americas, and make doing business with NTN even easier,” comments Pete Eich, Executive Officer and Deputy General Director of the Americas Region. Available in English and Spanish, the site features an upgraded part number interchange search, an enhanced distributor search that covers all regions of the Americas, and the ability to find a bearing using critical dimensions. Most notably though, the site allows visitors from all regions access to NTN’s training programs such as its 3-day Product Training School, E-Knowledge Web Training and On-site Mobile Classrooms that come to you. E-Commerce sites such as Distributor On-Line and Customer Portal for US and Canadian customers remain accessible from the new site. Effective immediately, www.NTNAmericas.com replaces the separate websites previously operated by NTN Canada, US, Mexico and Panama. Founded in 1918, NTN operates more than sixty plants worldwide and is the third largest bearing manufacturer in the world.